Eschew Obfuscation T-shirts and More! These are hot! Eschew obfuscation, also stated as eschew obfuscation, espouse elucidation, is a humorous fumblerule used by English teachers and professors when lecturing about proper writing techniques. We are all about fun compilations of words so this is a favorite here. The typography looks very good in cool green and prints beautifully on any color shirt. Eschew Obfuscation comes in lots of different styles. We have Sweatshirts, hoodies, tanks and spaghetti tops. 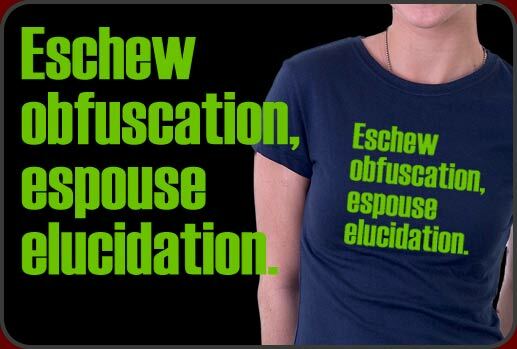 You can also get Eschew Obfuscation shirts in women's, men's and children's styles as well as cups, mugs and buttons! See them all by clicking on the image to the left!